Me and my friend stayed one week at Irini Family and were very happy with everything. The room had everything we needed and the location was perfect: right behind the main road - which was not at all audible during the night - and at the same close to the beach. The owner was very friendly and always willing to help us. We had an amazing time staying at Irini Family and would definitely come back and recommend. Ägaren gjorde allt det han kunde för att hjälpa oss. Excelente localização e ótima recepção pelos anfitriões. Local familiar e discreto. Embora no meio do comércio, isolado de sons. Posizione centralissima, vicino farmacia e banca. Titolare sempre presente, accogliente e disponibile. Accoglienza con acqua e frutta fresca. Ha un balcone spazioso ed è molto ariosa. Economico. Die Matratzen waren sehr gut, der Kühlschrank war ebenfalls i.O., Bettzeug und Handtücher wurden alle 2 Tage gewechselt. Pokój duży, odpowiednio wyposażony. Widok z pokoju trochę nieciekawy, ale uważam, że jakość w stosunku do cen hoteli w tej miejscowości była bardzo dobra. Na krótki pobyt bardzo dobre miejsce i lokalizacja. Gospodarze bardzo mili. Polecam. Irini Family Studios is located in the seaside village of Platanias, about 6.2 mi west of Chania. The family-run property offers apartments with cooker and fridge, only 150 feet from the beach. Each traditionally styled studio has a balcony, and offers a TV and a safe. Wi-Fi is free in the entire property. The beach of Platanias is well catered by beachfront bars and café-restaurants. 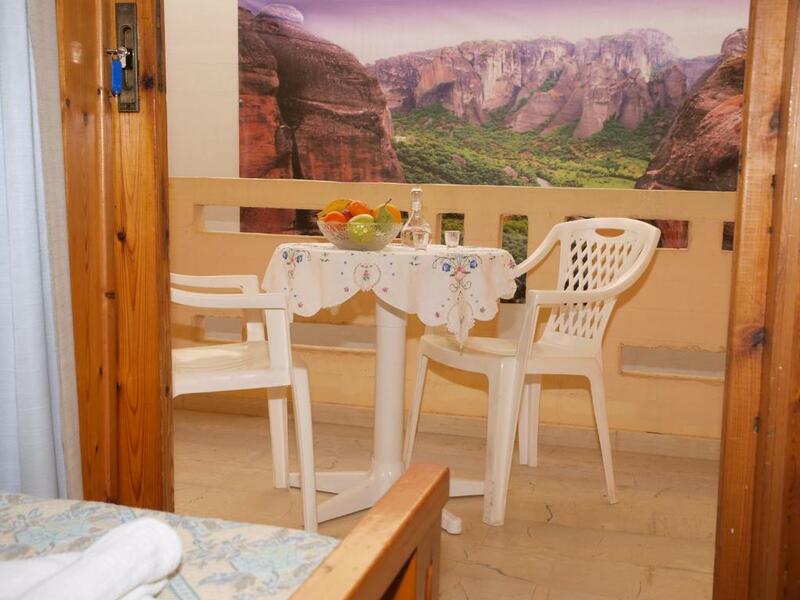 With Irini as their base, guests can explore the surrounding villages of the Chania vicinity. Free parking is provided. When would you like to stay at Irini Family Studios? Upon arrival, guests are offered a complimentary drink and a jar of homemade traditional sweets. Please note that the air conditioning can be used at the extra charge of EUR 5 per night. House Rules Irini Family Studios takes special requests – add in the next step! Irini Family Studios accepts these cards and reserves the right to temporarily hold an amount prior to arrival. Please note that Irini Family Studios is next to Cafe Manteio. Please note that the use of air conditioning is subject to extra charges. The beds were horribly uncomfortable. The hosts did not understand the issue with the beds, or that the towels were used when we placed them on the floor. And we would like to have our own personal belongings too ourselves next time!! The owner was a lovely chap.